It was about five years ago that David Hodgkins enrolled in a school in Houston to hone his skills in auto body repair. Before he graduated, Hodgkins saw a two-door Chrysler displayed at a local dealership. Its beauty took his breath away. The car had recently been acquired from Forest Park, Ore., and according to the Texas dealer, it was an all-original 1962 Chrysler 300 with just more than 72,000 miles on the odometer. Hodgkins was so impressed by the Chrysler that he immediately telephoned his grandfather, Ralph Rideout, in Homosassas, Fla., to share the news. After listening to his grandson excitedly describe the remarkable condition of the Chrysler, Rideout asked his grandson if he should buy it. Without hesitation, Hodgkins responded yes, and that is how Rideout came to be the proud owner of a 1962 Chrysler 300 two-door hardtop coupe. 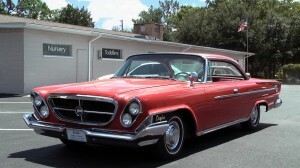 Rideout and his wife, Deanna, were married in Maine in 1962, so the 1962 Chrysler is a natural addition to their family. Arrangements were made to have the car trucked 1,000 miles to Florida. Rideout says that until the coupe was delivered to his home, he had only seen pictures of it on the dealer’s Web site. He wasn’t worried about buying the Chrysler sight-unseen because he has complete faith in his grandson. When new, the red 1962 Chrysler had a base price of $3,323, which figures out to be a little less than a dollar a pound for the 3,750-pound car. It was one of 11,341 such cars Chrysler manufactured that model year. Extra cost optional equipment on the hardtop coupe included: AM push-button radio ($129), power steering ($108), power brakes ($48), tinted windshield ($29), full wheel covers ($19), remote left mirror ($18), and windshield washer ($14). The original owner evidently did not opt for the front bucket seats that swiveled when the door was opened in order to make entering and exiting easier. Air conditioning was also rejected. The front bench seat in the Chrysler is upholstered with two different varieties of red vinyl. Rideout says virtually every surface inside the car is red. The single exception is the black carpeting. The Chrysler is only 1 inch shy of stretching 18 feet. The luxurious car rides on a 122-inch wheelbase supported on 8.00×14-inch tires. “It’s huge,” he exclaims. The previous model year was the last of the soaring fins on Chryslers. The fins disappeared as a styling element from the rear fenders in 1962. Rideout’s Chrysler also is the first year for Chrysler to produce a unibody car. 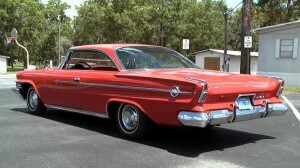 Just because the 1962 hardtop coupe is big and heavy doesn’t mean it is slow. Under that expansive hood is a two-barrel Carter carburetor sitting atop the 383-cubic-inch V-8 engine that produces 305 horsepower. Rideout thoroughly enjoys sitting at the wheel of his Chrysler being dazzled by the astrodome instrument panel with the push buttons to operate the automatic transmission to his left. “I like to look at my car and polish it,” he says. “Driving this beauty takes me back 48 years to appreciate the automobiles of that day,” Rideout explains.